I’m a longtime fan of author/illustrator Maryann Cocca-Leffler. Not only does she have a truly cool name, but her books are awesome. So when I heard she had a new release — called GROWING SEASON — coming from Sterling Books in April, I hit the pre-order button so fast I almost sprained my finger. I now have the book, and I must say, and it was worth nearly injuring myself to acquire it. 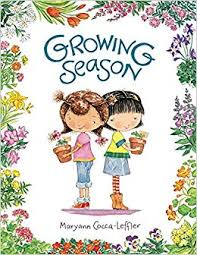 GROWING SEASON is about El and Jo, two best friends who are short in stature. Not that that stops them from keeping up with their taller classmates. They are the perfect size to be elves in the holiday pageant, the perfect size to sit side-by-side in the special reading chair, and the perfect size to help each other out with their class gardening project. But then, Jo grows and El doesn’t. And, Jo’s zinnia blooms, while El’s aster stays determinedly green. To top things off, Jo visits her out-of-town grandparents for the summer while Jo stays home to tend to their plants. Alone. Want a hint to what happens next? Consider the possible double meanings of the title. Let’s just say a lot of blooming goes on. The story is simple and layered. The problem is straightforward and one many kids will have encountered — being different from their peers and possibly surpassed by a friend. And even though that’s a problem, it’s not a PROBLEM, if you know what I mean. The story is sweet and hopeful and affirming. The parallels between the girls and the plants are clever, and there’s a lovely happy ending. And the art is sublime. The front end papers show an array of pots labeled with the name of the flower that will eventually grow. The back end papers show those flowers in their full glory. Jo and El are adorable and their teacher, Mr. Diaz, is awesome. I kind of want to frame the class picture that’s the center spread and hang it on my wall. And, in the back, there’s information about plant life cycles. So, yeah. It’s a cool book. 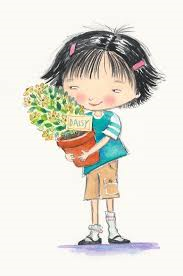 Now, I like picture books with gardening elements. I’ve written two, and I have one more in the works. But even if gardening is not your thing, I think you’ll like this book for everything it has to say about patience and friendship and hope and fortitude. And after reading it, you might blossom just like Jo and El. Maryann is one of my favorite author/illustrators…and also a critique buddy…so I saw this fabulous story in its early stages…and honestly, it was awesome from day one! Thanks for a wonderful review, Pat! That’s great, Vivian! I’ve never met Maryann. Please let her know how much I truly like this book! What a wonderful book. I’ll get my hands on it soon. Because I lived through my daughter’s fluctuating friendships, I feel this book’s affirming message already. Your comments are lovely. Thank you for sharing this, Pat! It’s on hold at my library. Can’ wait to see it! Looks perfect for a spring read! Thanks for sharing. This book is on its way to me and I am so excited! Now if only my garden will take the hint and attend to a bit of bloom. Nice review! I’m excited to see this book! It’s so pertinent for kids whose growth spurt is delayed. I’m lovin’ this book already! Thanks, Pat. Everything about Growing Season looks wonderful. I’m looking forward to reading it! Definitely adding this to my TBR pile! Thanks for the profile, Pat. I grew up on a farm so growing season is a very special time even though I’ve lived in town since I’ve been married. Lovely concept for 2 friends growing and blossoming. 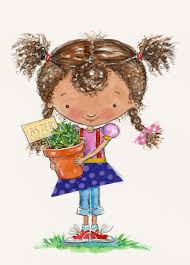 I love gardening books for kids–um, I need to learn the lessons in patience over and over. Thanks for spotlighting this sweet book. Lovely! I love gardening books! Thanks for this one! Congrats!